On or about October 15, 2017, employers with 100 or more employees in Oregon can expect to receive notice about an upcoming deadline for OregonSaves, the State or Oregon’s new retirement savings program. We wanted to make sure you knew that these notices would be going out, and we are hoping you might be able to help us raise awareness about the deadline. Employers with 100 or more employees in Oregon will need to either register to facilitate OregonSaves or certify that they are exempt from the program by November 15, 2017. Facilitating employers are encouraged to register early and avoid the crunch at the deadline. Registering early will allow plenty of time for extra support, if and as needed. 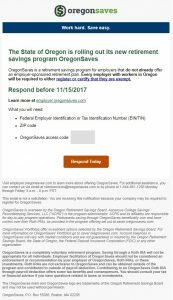 The notice from OregonSaves will include a link to http://employer.oregonsaves.com and a unique access code employers will need to complete the registration or certification process online. 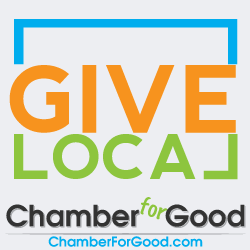 For employers with an email address on file, the notice will be sent by email from clientservices@oregonsaves.com. For all others, it will be sent by regular mail in an envelope marked “OregonSaves.” A sample of the notice is attached for reference. OregonSaves will roll out to smaller businesses according to the timeline attached. Employers can expect to receive notice several months ahead of the deadline for their wave. If an employer doesn’t receive the notice and should have, has questions about which wave they’re in, or needs assistance, they can reach out to the OregonSaves Client Service team at (844) 661-1256 or clientservices@oregonsaves.com.